The JR Jones Show is a traditional country and Americana show of new local, national and international talent. Filming takes place locally as well as by video for those not able to personally come to Nashville. We feature our own TV show band members as well as Papa Darwell and the Risk Taker band from Long Beach MS. 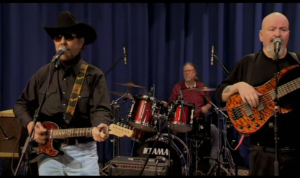 The Risk Taker band provides very talented musicians, singers and comedy. The first show was aired in August of 2013.